Fascinating facts about Pirates, their lives, weapons, ships, and history, by the author of The Pirate Empire, available on Amazon. When I was a child in grade school (this was a long time ago, but not that long ago, because, you know, I’m still here) I was taught that there were seven races – white, yellow, red, black, and brown were the main ones, with kind of sub-races of Arabs and Australian aborigines. As a child I thought this was funny, and hypothesized that green and blue people would be a lot more fun to have around to form the seven. Like I said, this was a while ago. But I thought about race, and I’ve continued to do so. Most of my musings were internal. I lived in the American South, and the relations between the White Race and the Black Race were not good. My mother supported Civil Rights. My father supported the “rights” of business owners to only serve people they wanted to. Any talk about race in our household ended up with shouting. Then I grew up and started reading about Pirates. So, if one “race” can change its definition so profoundly, why do we care about race at all? The answer is surprisingly specific. It begins in 1676, with a man named Nathaniel Bacon. He was cousin to the Governor of Virginia, a relative of Sir Francis Bacon, the King’s Lord Chancellor. In the new colony, he soon owned two plantations and was a member of the ruling elite. The former ruler of England, Oliver Cromwell, had tried to turn Virginia into a virtual penal colony. He had sent hundreds of thousands of “undesirables” – Irish citizens, prisoners of war, prostitutes, debtors – to the colony as “indentured servants.” Terms of indenture often exceeded life expectancy. And at the same time, merchants were bringing captured Africans to Virginia, also to be sold as “indentured servants.” People so indentured could be bought and sold, whipped, and otherwise treated unfairly. They were all slaves in fact if not in law. If such a person did survive past their term, they were supposed to be given land, cash, and other materials suitable for starting a small farm. But this rarely happened. And on the few occasion when a small-holder was able to start a farm, he found that the colony taxed not on land holdings, or on income, but used a “head” tax, meaning that a man who owned 50 acres paid the same tax as a man who owned 10,000. In 1675, war with the Native Americans broke out. Bacon favored slaughtering the Natives, men women and children. This won the approval of the poorer citizens, who had suffered the most in raids. The Governor – who had profitable fur-trading deals with the tribes, counseled caution. Bacon and the Governor argued for a year, until fresh elections put men favored by Bacon in charge. Bacon made war on the Natives, repealed the unfair tax laws, wrote a “Declaration of the People” and offered freedom to any servant or slave who would join him. 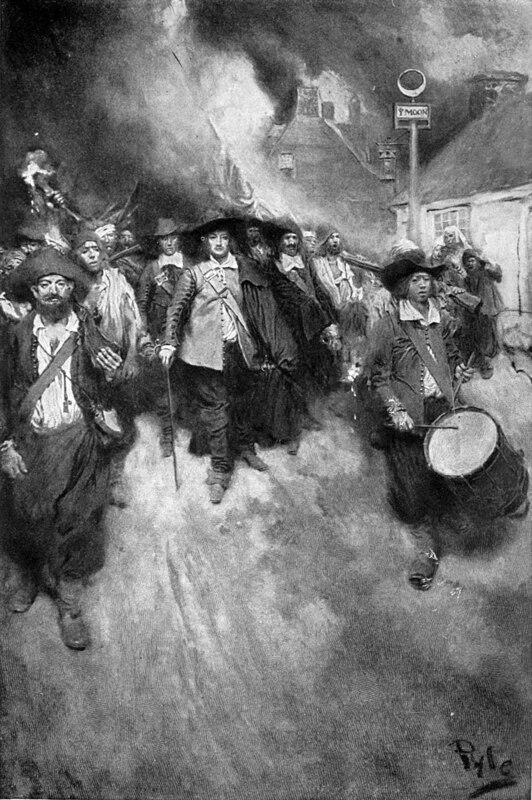 The result, when the men who had been in power fought back, was called Bacon’s Rebellion. “Levelling” meant that the people wanted more equality between the rich and poor. When a similar, smaller rebellion broke out in Maryland, the Powers That Be realized that they need to Do Something. Of course they had no intention of sharing their own wealth and power. Instead, these men analyzed the society in which they lived. It consisted primarily of the rich and the poor, with no middle class. There was no “buffer” between the lord and his servants. And the servants outnumbered the lords by 100’s to one. A similar structure was in place in England. But in England, there existed a “yeoman” class – large landholders, who lived with the peasants, but tended to side with the Lords, since (very rarely) a member of the yeoman class was allowed into the aristocracy. What the American Colonies needed was a similar system – a slightly elevated class of peasant, who would keep the other peasants in line. Up until this point, race had not entered into class considerations. Indentured servants were one class, and the large landowners were another. But during Bacon's Rebellion, Black and White servants and slaves had worked together seeking more egalitarian terms. So the large landowners began to separate the pale-skinned and dark skinned servants. They told the Whites that this was because the White servants were “better” than their darker neighbors. It was a novel idea, and made these poor people feel important. Soon laws were passed requiring a judge’s signature before a White servant could be beaten. Then, over the next 20 years, Africans and Native Americans were deprived of judicial rights, property rights, electoral rights, and family rights. Servants of European ancestry were finally given their dues when their terms of service were over. And the notion of the “White Race” was born. Its purpose was to keep the poor Whites intent on “being better” than their Black neighbors. *for information on Bacon's Rebellion and its aftermath, see Don Jordan and Michael Walsh's excellent book "White Cargo"
And it worked. I have seen it firsthand. No one is harder on “The Black Race” than poor Whites. Even today, some people who are poor, perhaps drug addicted, perhaps homeless, will comfort themselves by thinking “well, at least I’m not Black.” Yet, by concentrating on keeping others down, people have had little time to better their own lot in life. A look at a map shows that those areas famous for racial division also tend to be the most mired in poverty. And what has this to do with pirates? Bonnet (who by birth, breeding and education should have sided with his European crew member), informed his crew that “Pirate” was a race unto itself, and anyone who became a Pirate gave up any other racial identifiers. One more reason I want to be a pirate. Savage natives, bloodthirsty pirates and the Royal Navy. Can Captain Scarlet ever get a break? Captain Scarlet's latest adventures on the island of pirates. In addition to blogging about pirates, I'm also reviewing the latest pirate series, Black Sails on Starz. A mix of fact and fantasy, Black Sails intermixes historic pirates like Charles Vane and Benjamin Hornigold with the fictional pirates from Robert Louis Stevenson's Treasure Island. I think it's a fun mix, if you don't mind your pirate stories fictionalized. Check out my reviews here.